Really intrigued by reports and comments on Nick Malgieri's Turkish flatbread. Can anyone post the recipe, please? Original recipe yield: 2 loaves. stir well. Cover and let sit at room temperature overnight. bowl. Cover and let sit at room temperature overnight. the bowl. Cover and let sit at room temperature overnight. water. Let stand until creamy, about 10 minutes. tight oval loaf. Sprinkle two sheet pans with corn meal. cloth and let raise in a warm place until doubled in size. done when their bottoms sound hollow when tapped. Many thanks for your reply. I already have this recipe - and others for many things Turkish- which is why I am interested in Nick Malgieri's to see if it is really different. Oh well, perhaps someone will post it. If you want Nick's recipe, buy The Modern Baker. There are a lot of excellent recipes in it. You won't be disappointed. Ekmek is just the Turkish word for bread, usually not a flat bread. Ekmek means just "bread". 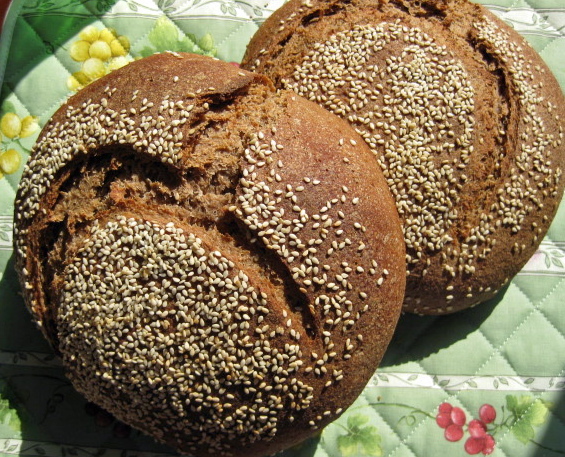 My Turkish ekmek version is not a flat bread, but a sourdough yogurt rye with sesame.